It's not a secret that there are many variations of the most popular blackjack game. Its popularity grows each day, so we offer you a short guide to the most popular Internet blackjack variants in order you could choose the best one for you. Number of decks - 2. Dealer' right. Stands on soft 17. Doubling. Not allowed after splitting. Number of bet positions. One bet. Number of decks - 8. Doubling. On any two first cards; after splitting allowed. Splitting. Re-split to 3 hands. Number of bet positions. One. Number of decks - 5. Doubling. There is no doubling after splitting. Number of bet positions. Five. Number of decks - 4. Doubling. On any first two cards. Splitting. Resplit to three hands. Dealer' right. Hits soft 17. Both his/her cards are face up. Number of decks - 1. Dealer' right. Hits on soft 17. Doubling. Any first two cards, after splitting allowed. Doubling. On any two first cards, after split allowed. Splitting. Re-split to three hands. Dealer' right. Hits soft 17. Doubling. On any two cards. Splitting. Is allowed only once. 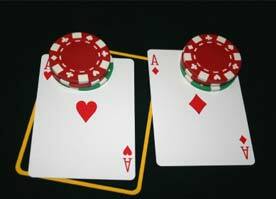 The player can switch the 2-nd card and play two hands. Some blackjack variants were recently added to the common blackjack version: Pontoon Blackjack, which is one of the twenty-one game ancestors, Blackjack Pro and Double Exposure. Other blackjack variants differ sharply comparing with the basic version. Among them: Triple Shot, Extreme 21 and Blackjack Switch.